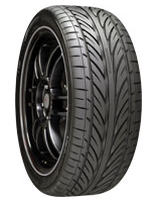 The Hankook Ventus V12 Evo K110 tire is one of the top selling high performance tires on the market today. And it is for good reason, this tire is a solid all around performer on either wet or dry pavement, while at the same time is gives a smooth comfortable ride which is rare for tires such as these. Handling and traction on the Hankook K110 quite frankly, exceeds expectations. This is due in part to Hankook’s tread compound and their unique Multiple Tread Radius technology. The tires feature a directional tread pattern and sport circumferential and Y shaped grooves in the tread. The result is excellent maneuverability on wet roads and a lesser risk of hydroplaning. Inside the Hankook Ventus V12 you will find two steel belts that are wrapped with jointless nylon, along with rayon layers in the sidewall to give the tire added strength and stability at higher speeds. Prices for the Ventus K100 tires range from approximately $90 for the 16 inch series to around $250 for the larger 21 inch series models. Who Are Hankook Ventus V12 Evo K110 Tires Designed For? Hankook tires has designed the Evo K110 for high performance use on various models of coupes and sedans. Since this is a summer performance tire, driving in winter weather conditions should not be attempted. Hankook tires does not provide a tread life guarantee on the Ventus V12 Evo K110, which is understandable considering it is an ultra high performance tire. However, you will find a first 2/32 inch of wear for tire uniformity. There is also a 5 year guarantee on materials and workmanship. It calls for free tire replacement during the first 25% of wear, followed by a prorated amount down the last 2/32 inch of useable tread on the tire. A road hazard warranty is provided during the first 25% of wear as well.